The largest fundraiser of the year for the Redwood Discovery Museum is also one of Humboldt’s wildest and silliest events — which is saying something. Teams with themes and solitary dignitaries all dive into the frigid waters of the bay to raise money for the interactive educational children's museum at the Perilous Plunge on Saturday, Feb. 6 at 10 a.m. on Eureka’s waterfront (free to watch). 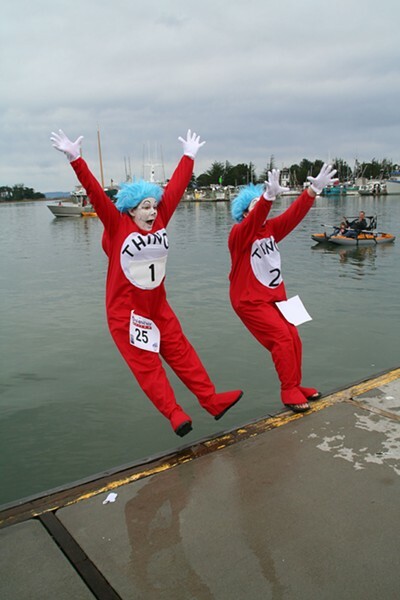 Previous plungers have included a Dr. Seuss, a red fish and a Thing 1 and Thing 2. Now in its 15th year, spectators can cheer on this year’s teams including The Wet Pussycats, Dunkin’ Don is Nuts, Recreation Rockstarz and others. Before they get wet and wild, participants proudly parade from Old Town to the boardwalk, and you don’t want to miss that. The parade starts at 9:30 a.m. The festivities include awards for best team jump, best costume and the coveted King and Queen titles. This year, there’s no after party but the night before the plunge, plungers and their friends can enjoy an all-ages Open House Beach Party with food and drink at the Discovery Museum on Friday, Feb. 5 at 6 p.m. ($15 for non-plungers). Go on, take the plunge or shell out for someone else’s leap. Either way, you’re helping support one of the community’s best youth resources. Monies from the splashy event enable the museum to develop new exhibits, programs and camps, provide scholarships and free programs to the community, as well as maintain low admission and membership rates. That’s worth getting your feet wet.